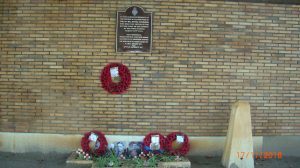 The Association left early on Friday morning, the 16th November for the long drive down to Mons, Belgium, to start the Kaiserschlacht & 100 day Offensive Tour. After a rapid channel tunnel crossing, the weather deteriorated with heavy rain making the last few kilometers interesting. 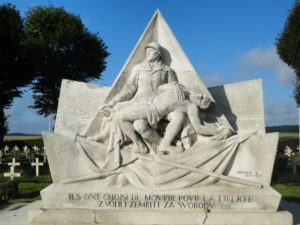 However everyone arrived at the hotel Le Monte Cristo in good spirits. 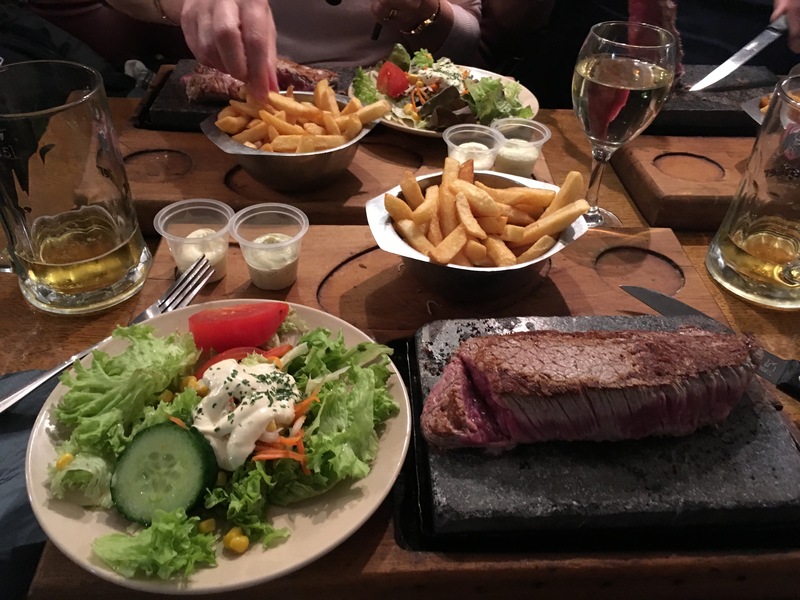 The party then dined in Mons town centre, cooking their own steaks on a hot stone slab, whilst enjoying the local beers. 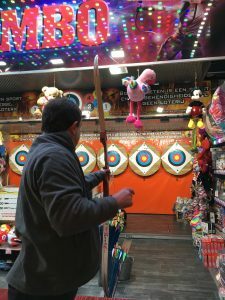 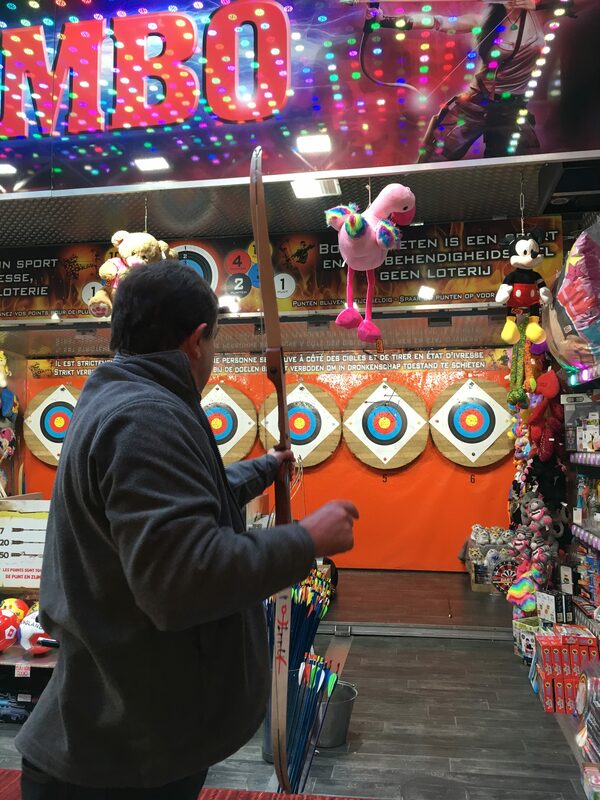 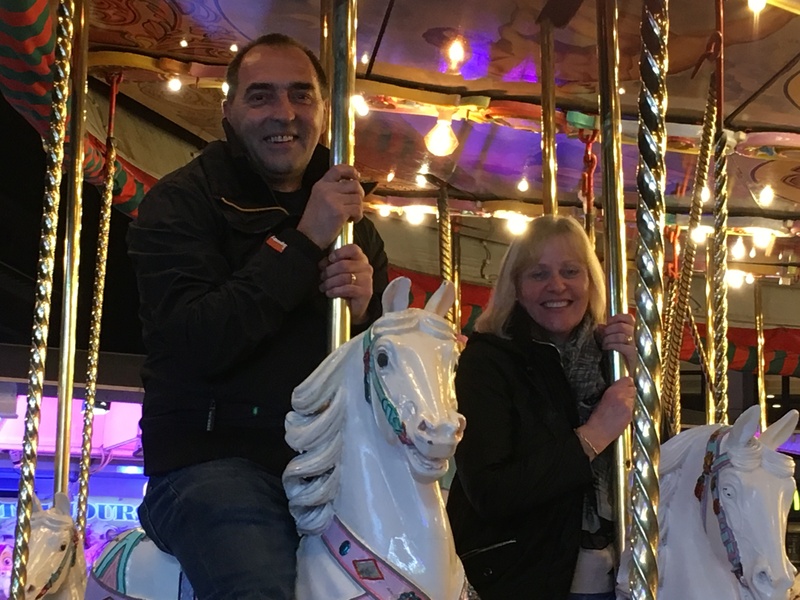 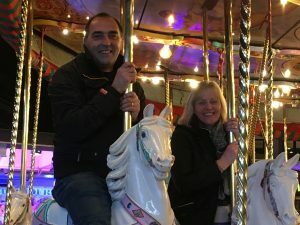 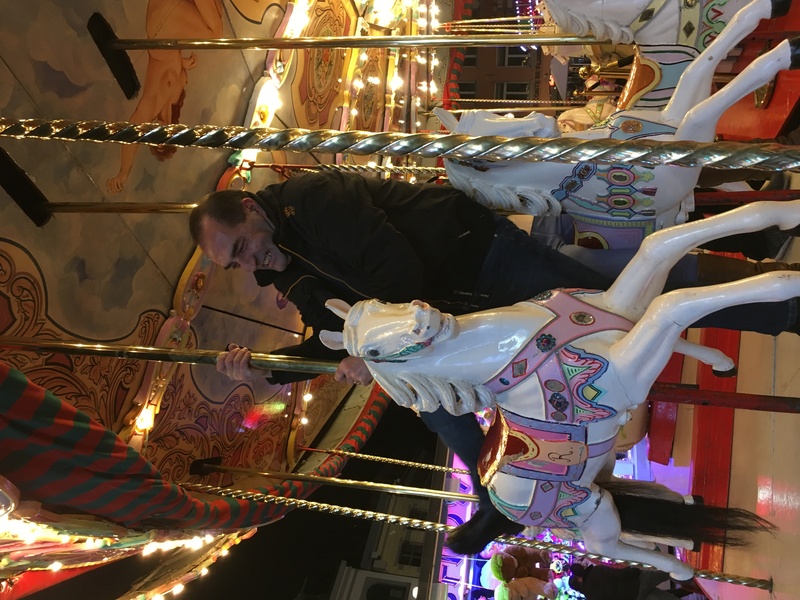 One of the highlights of the evening was the presence of the Christmas Fair, where members of the tour demonstrated their Archery skills and Yeomanry Horsemanship. 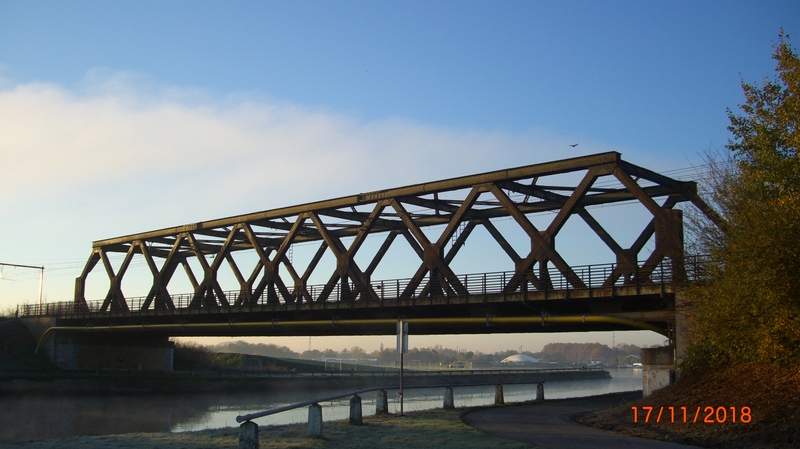 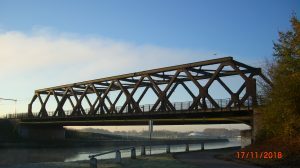 Saturday morning saw a sharp frost and an early start, heading for the famous Nimy Bridge, Mons, to discuss the formative and concluding days of the Great War. 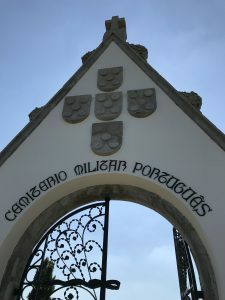 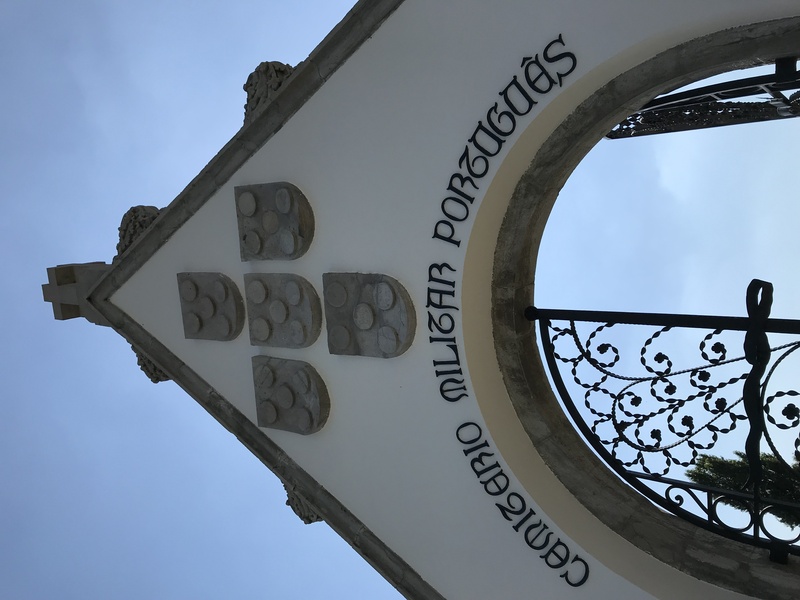 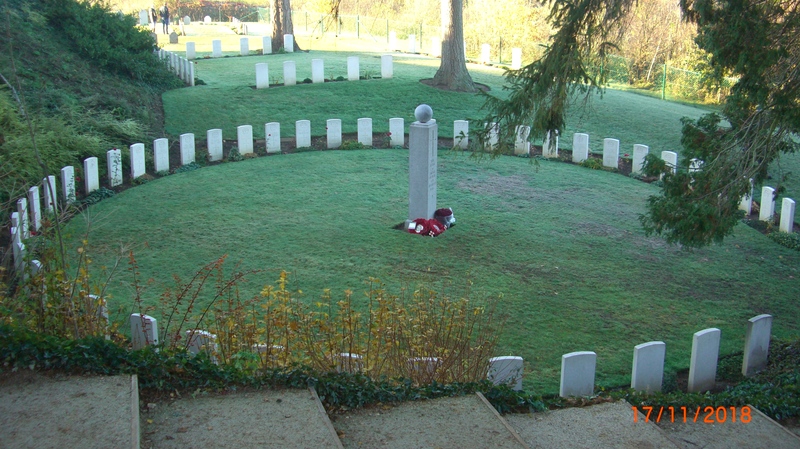 From the Nimy Bridge we moved onto to the Saint Symphorien Military Cemetery and visited the Grave of Lt Dease VC and the first and last British soldiers killed in action during WW1 – this site was visited the week before by the British Prime Minister. The next phase of the Tour saw us move into France only to be held up for sometime on the motorway, by the very start of the Yellow Vest Protests. 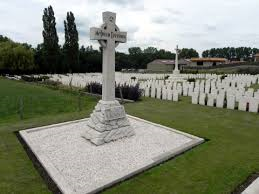 Eventually we made our way to the Templeaux Le Guerard Miltary Cemetery which holds the graves of 3 Suffolk Yeoman, belonging to the 15Bn Suffolk (Yeomanry) Regiment which saw their largest and most significant action of the 100 day Offensive on the 18th September 1918. 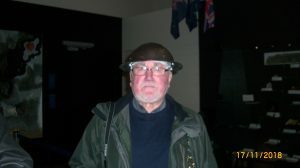 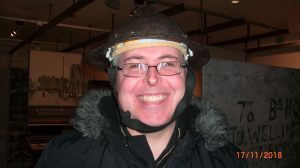 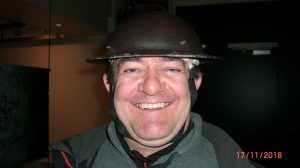 The part played by the Suffolk Yeoman was the prelude to the famous assault on the Hindenburg Line a few days later by the British, Australian and United States Troops, which resulted in the formal collapse of the German Army in France and Belgium. 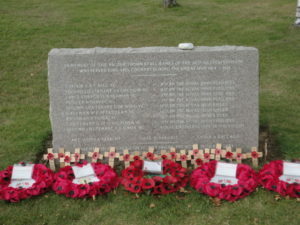 A short service of remembrance took part at this location and a wreath was laid at the Cross of Sacrifice and individual wooden crosses at the Graves of CSM Chambers, Pte A Gray & Pte R Scott. 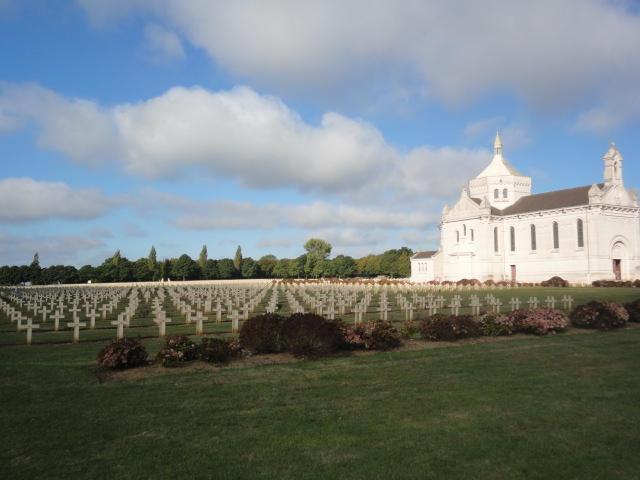 We then visited the impressive American Military Cemetery and Memorial at Bony, marking the US Army’s most significant action in this area. Then onto the Wellington Quarry, Arras, where we once again ran the gauntlet of the Yellow Vest Brigade. 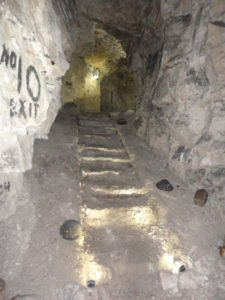 We just made the entrance to the Tunnels due to the delay and the group donned their PPE before descending into to the subterranean world of the tunnels. 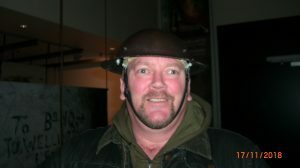 After the tunnel adventure, it was back to the hotel, for refreshments and the tour dinner. The final day saw us visit the sites of Neuve Chappelle and the Indian and Portuguese memorials. The afternoon once again saw us trapped by the Yellow Vest Brigade, but undeterred we pressed onto Auber’s Ridge and Fromelles, where both the Suffolk & Norfolk Yeoman passed on their routes north in 1918. 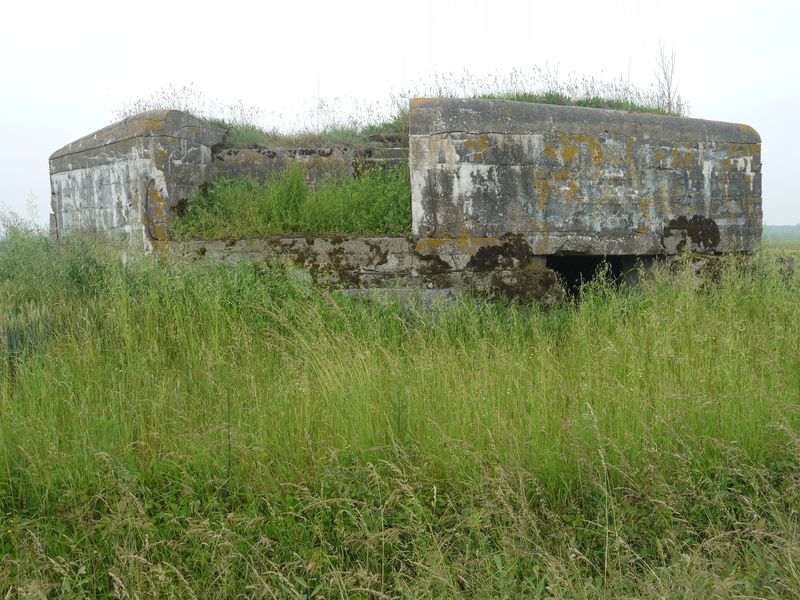 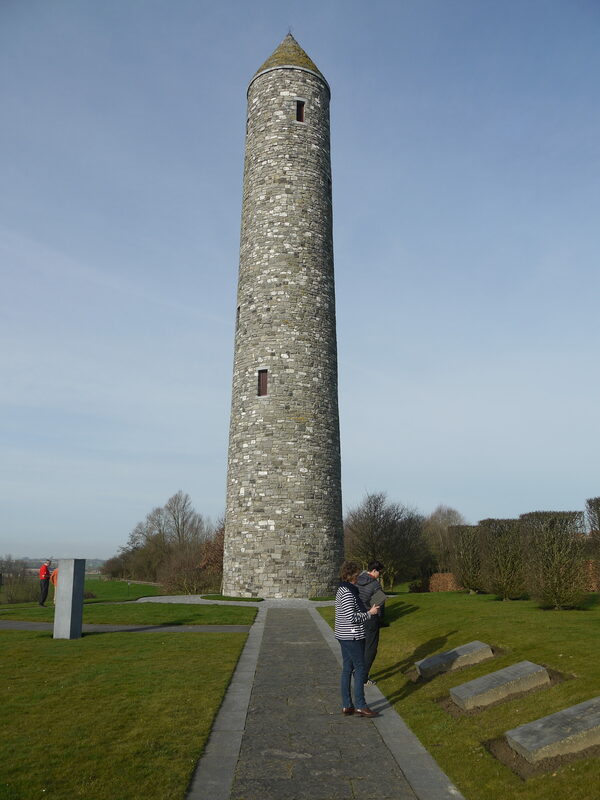 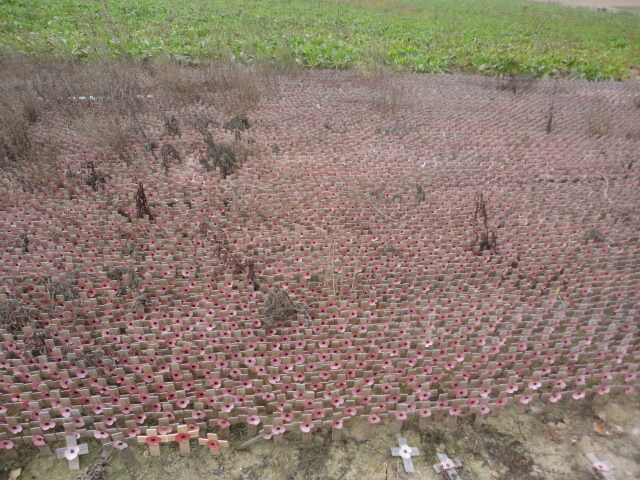 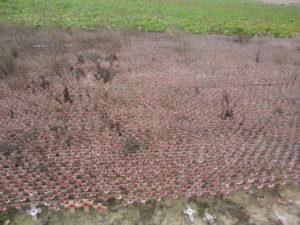 We were able to see and explore the formidable remains of the Hindenburg Line. 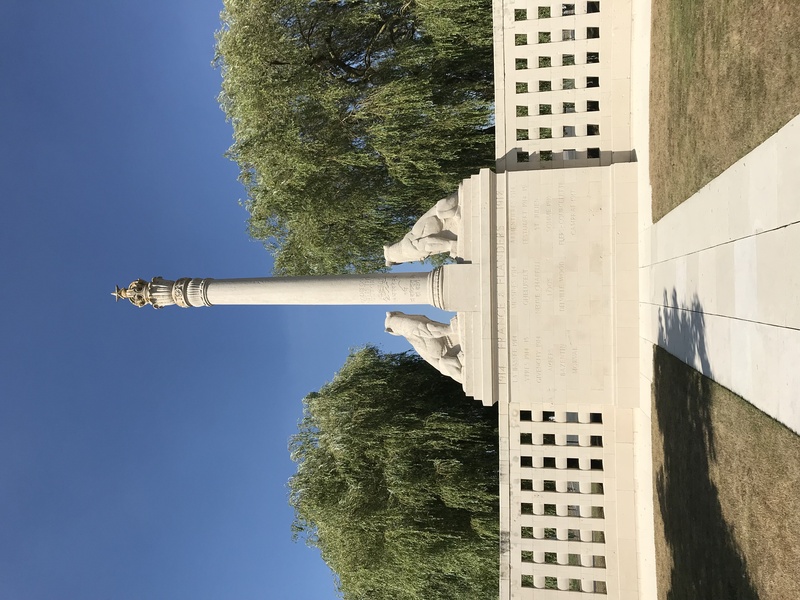 Our final stop of the day before departing for the Tunnel, was to pay our respects to the 32 men of the 12Bn Norfolk (Yeomanry) Regiment, buried in the Outtersteene Military Cemetery, This was the most significant action by the Norfolk Yeomanry in Northern France on the 19 August 1918, which resulted in the loss of 35 dead. 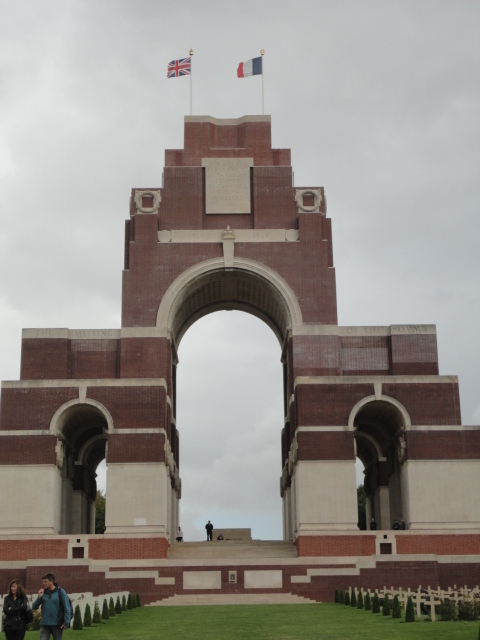 This action saw 6 x Military Medals, 1 x DCM and a Military Cross awarded for gallantry. 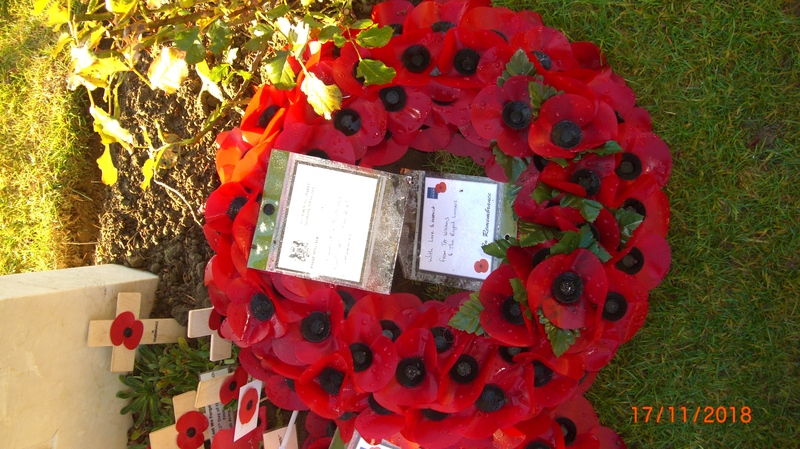 Once again we conduced a service of remembrance, laying a wreath and placing 32 individual crosses to the fallen. 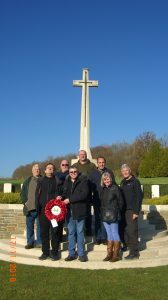 The tour finally returned home without any further interruptions by the Yellow Vest Mob, having been enjoyed as much by the guides as by the guests. 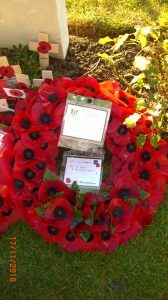 The Association wishes to thank the Suffolk & Norfolk Yeomanry Trust for their generous donation which allowed us to purchase wreaths and wooden crosses to pay our respects to the fallen Suffolk & Norfolk Yeoman of WW1. 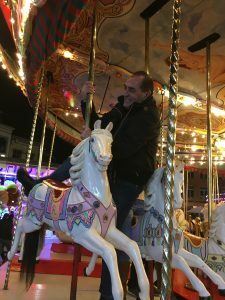 This entry was posted in News on 16 December 2018 by Trevor Jones. 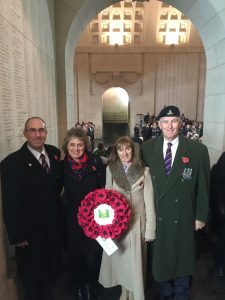 The Suffolk & Norfolk Yeomanry Association were proud to have laid a wreath on behalf of the Suffolk & Norfolk Yeomanry Trust and Association at the Menin Gate, Ypres, on the eve of the Centenary commemoration on Saturday the 10th November 2018. 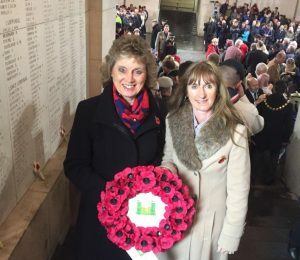 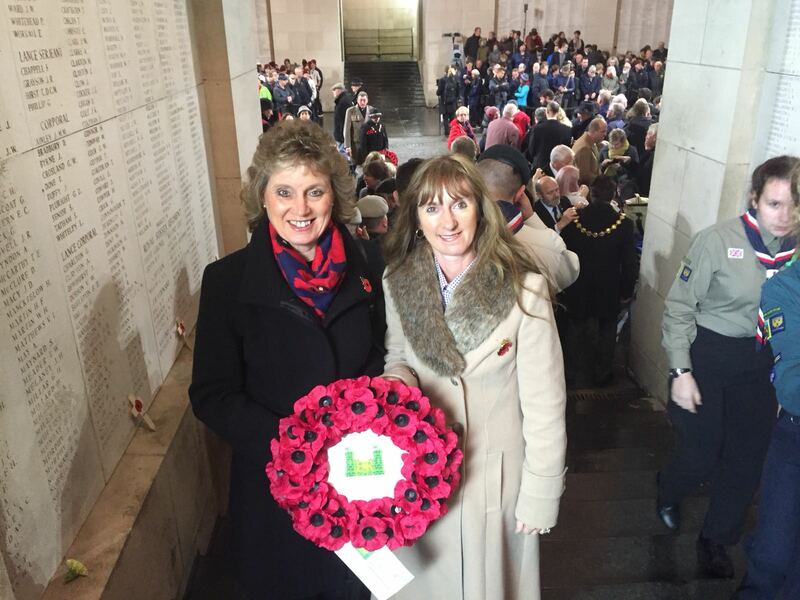 The wreath was laid by Mrs J Jones on behalf of the Trust and Mrs B Greengrass on behalf of the Association. 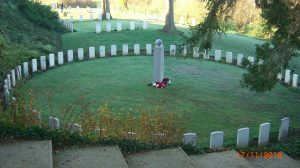 This entry was posted in News on 13 November 2017 by Trevor Jones. 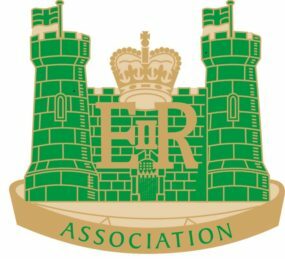 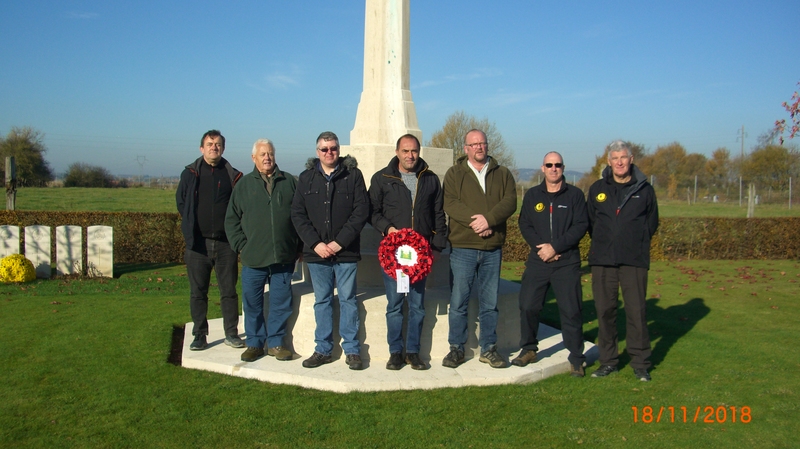 Beyond The Battlefield Tours – Annual Suffolk & Norfolk Yeomanry Association Battlefield Tour took place over the weekend 30th September to 2nd October 2016 to the Somme, Northern France. 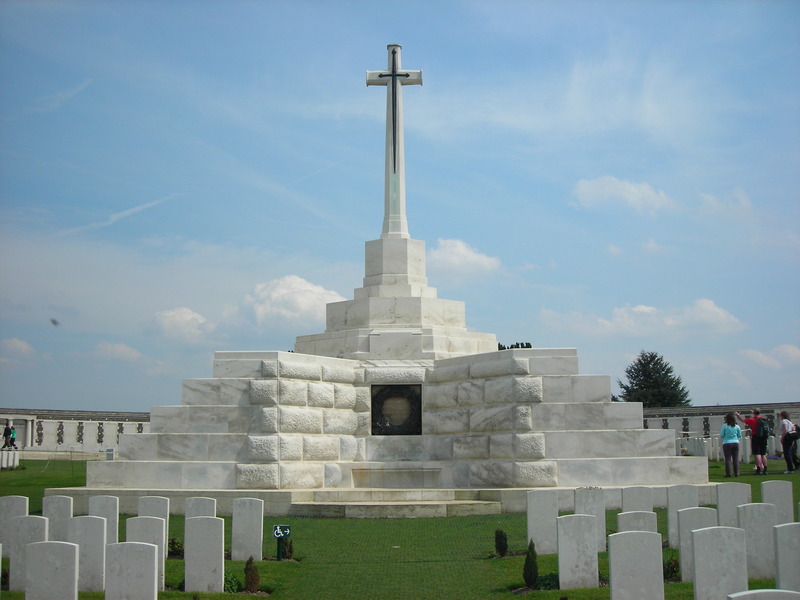 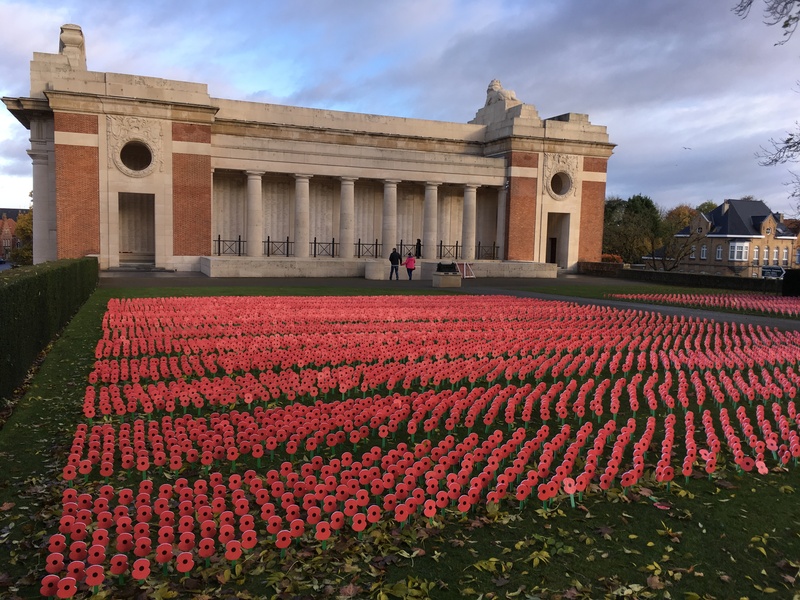 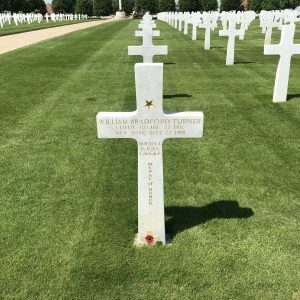 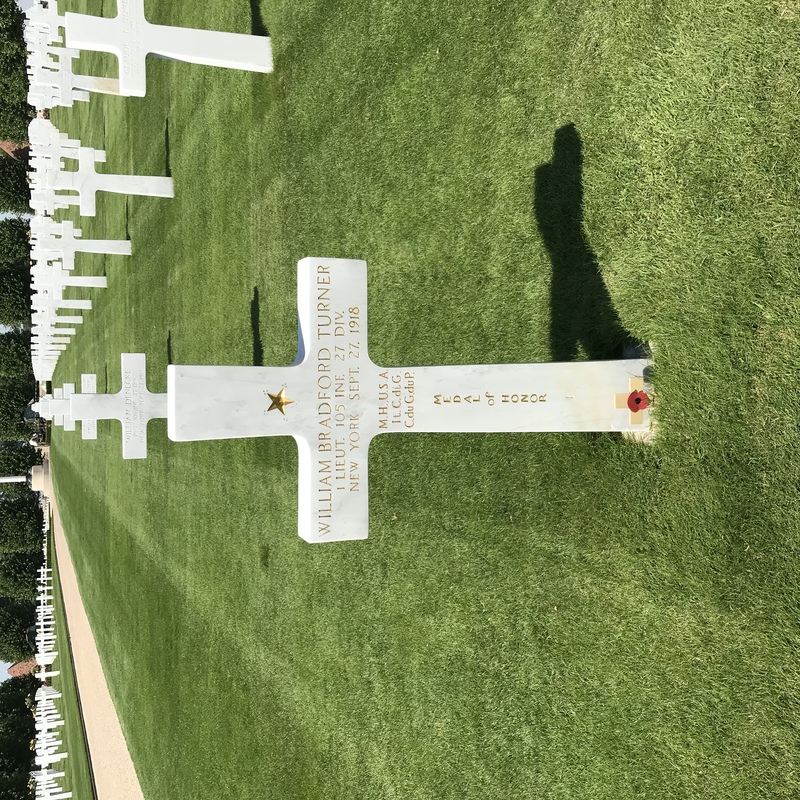 This tour turned into a personal pilgrimage for one of the guests who had recently discovered that her Great Grandfather fought and was killed in the Battle of the Somme and his remains interred in the Faubourg d’Amiens Cemetery in Arras. The Tour party left for France via the Euro Tunnel on a clear, bright and warm autumnal day, arriving at Arras in the early afternoon, allowing enough time to visit local attractions in the City and a stop for refreshments. A guided tour of the Arras tunnels was followed by a walk around the two main city squares, with overnight accommodation at the Hotel Mecure, Arras Centre. 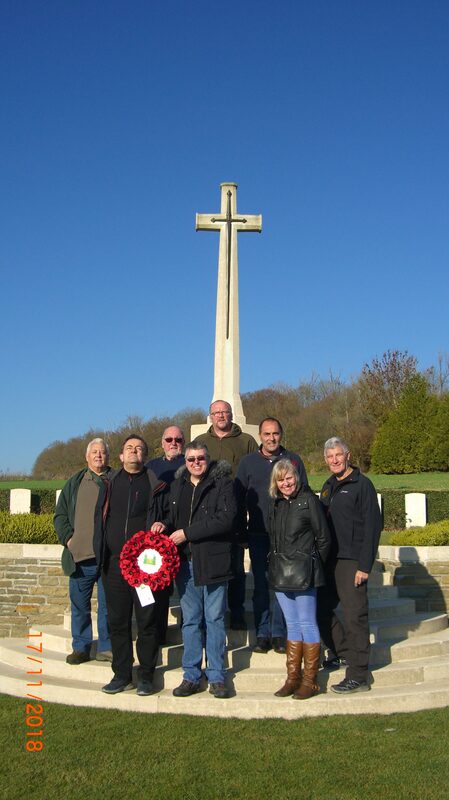 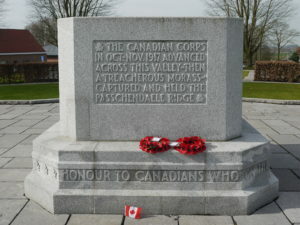 Up early on the Saturday and after a hearty breakfast, the party visited a number of memorials and cemeteries, whilst tracing the line of the Somme Valley north from the City. First stop was at the Polish and Czechoslovakian Memorial at Neuville-Saint-Vasst, just outside the City limits, which afforded a superb view of a landscape fought over in both World Wars. 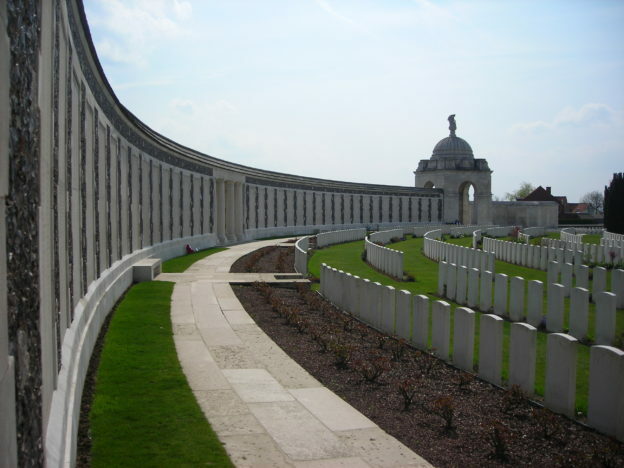 This vantage point allowed a panoramic view, stretching back from Arras towards the ridges surrouning the valley. 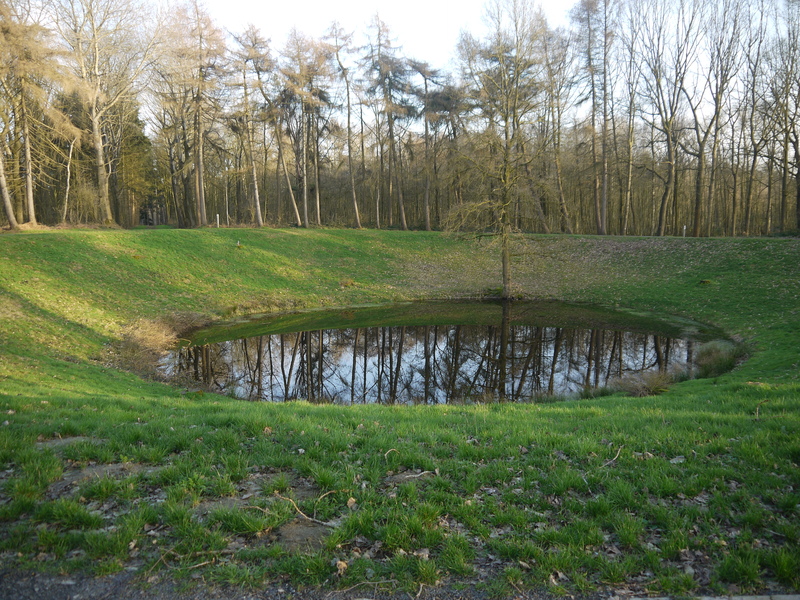 Visible from this spot, was the French Cemetery at Notre Dame Lorrette, Vimy Ridge, The Abbey, De la Vielle, at St Elmo and the sight of the first Tank Battle by British Forces at Flers-Courcelette . 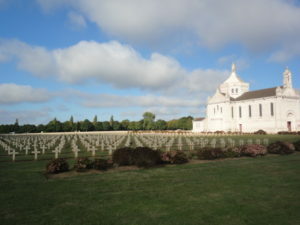 We then moved on to visit the haunting French Military Cemetery at Notre Dame Lorrette. 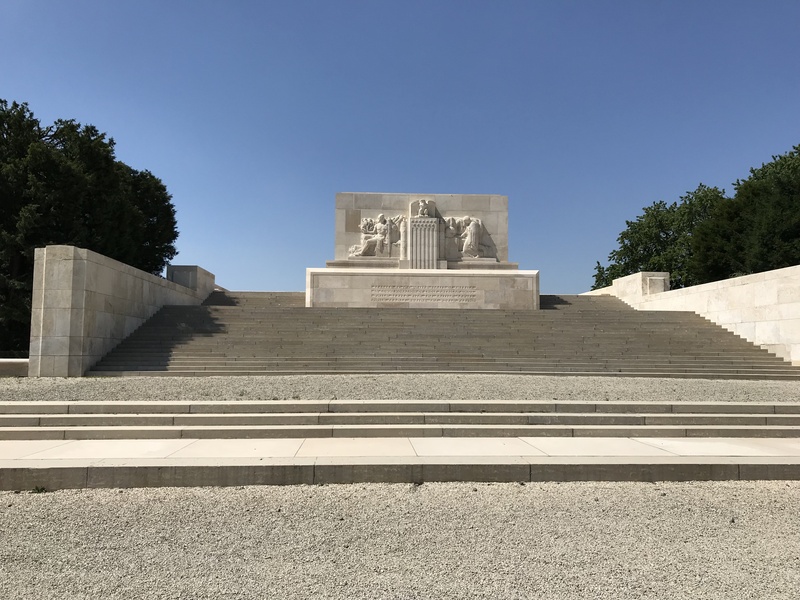 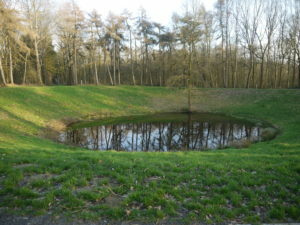 There is a new memorial to all soldiers of all the belligerent nations known to have fallen between 1914 -1918 in the area. 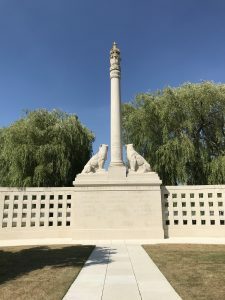 Next stop was the “Pals” memorial at Serre and walk around the battle ground, noting the recent commemoration of 100 years since the first Battle of the Somme by the placing of a Poppy for each British soldier to have fallen there. Moving on, we visited the Ulster Tower Memorial and the awe inspiring Thiepval Memorial which lists 72,000 names of the missing, before spending time in the Thiepval Visitors Centre. 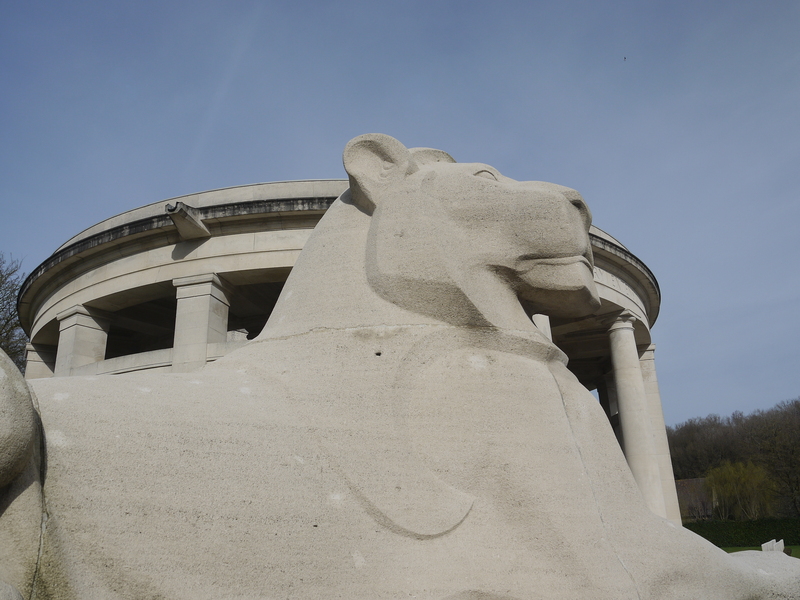 The last stop of the day was to the excellent Wellington Quarry Museum, Arras to discover how the British and Commonwealth forces fought a subterranean war. 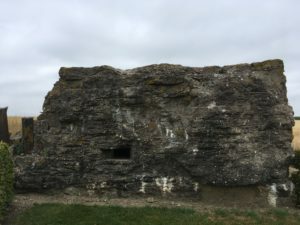 Walking through parts of the 20 km of tunnels we discovered that the purpose was to allow 24,000 men to emerge and attack the German Lines on the 9th April 1917, at the same time as the Canadian Corp launched their successful assault on the vaunted Vimy Ridge. 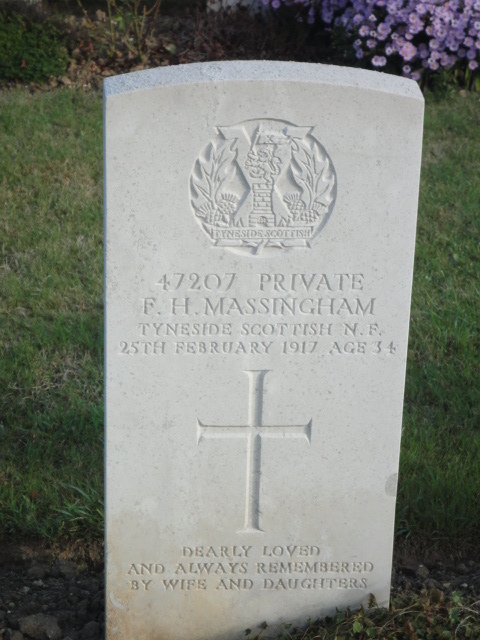 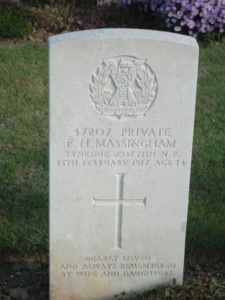 The pace slowed a little on the Sunday morning, as after a leisurely breakfast, the group made its way to the Faubourg d’Amiens Cemetery to pay their respects at the grave of Private Frank Herbert Massingham, the Great Grandfather of one of our party. Interestingly the Cemetery also holds the national memorial to the Royal Flying Corp and the fallen of the newly emerging RAF. 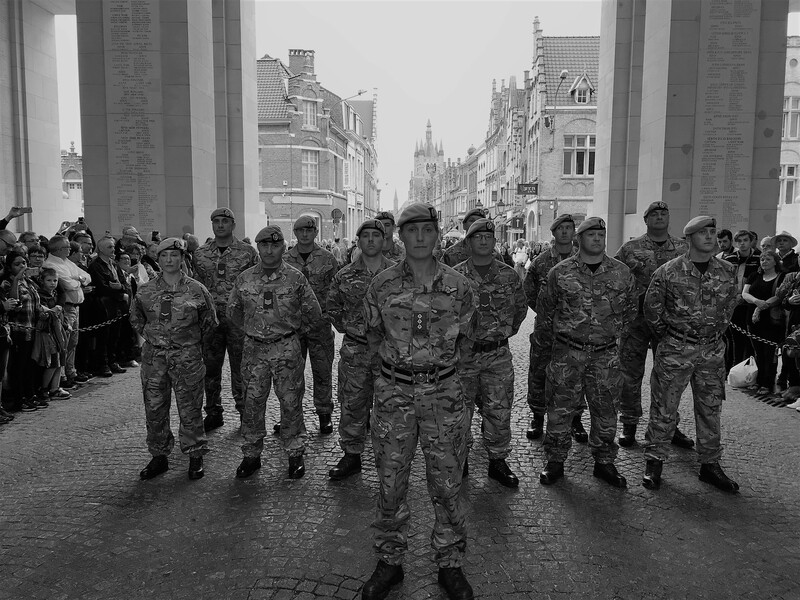 Following this sombre moment, the group return to Arras city centre to climb the Town Hall Belfry to take in the Battlefield vista before leaving for the return journey via Tunnel. 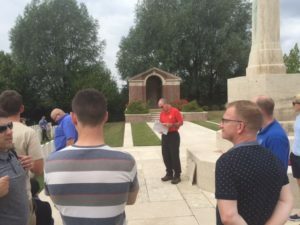 2017 Battlefield Tour Passchendaele – 100 Years On.